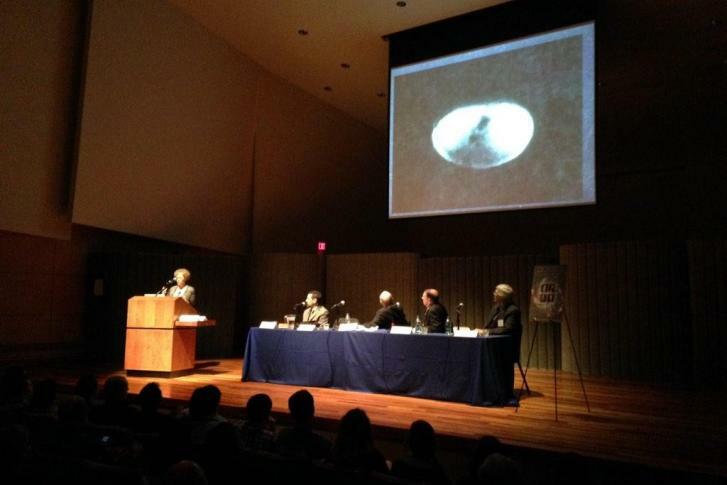 UFOs were the topic of a panel discussion Wednesday night at American University, and one of the speakers used the occasion to reveal evidence he called a "smoking gun." “We have come into possession of a couple of Kodachrome color slides of an alien being lying in a glass case,” author and researcher Thomas Carey told the near-capacity crowd in Abramson Recital Hall. He’s been researching the 1947 Roswell incident since 1991. Another panelist, Dr. Richard Haines, is a retired NASA scientist and co-founder of NARCAP (National Aviation Reporting Center on Anomalous Phenomena), which provides pilots with an anonymous way to report sightings they can’t explain. “We’re pretty ignorant yet about what we’re dealing with. And that’s the birth of a science. That’s how most sciences begin,” he said. Haines says NARCAP has collected hundreds and hundreds of UFO cases. She wrote her first story about UFOs in 2000. “My whole life was changed at that point. I was so compelled and so interested and so curious about this UFO phenomenon, because the more I studied it, the more I realized that you couldn’t write it off. … It’s not like you learn ways of explaining it. You learn more and more about the mystery of it, and the incredible documentation that’s out there,” she said. During her presentation, she detailed several interesting UFO cases, and showed some photographs, including one of a shiny, circular object. Kean says Chile and France have full-time government staffers who do nothing but seriously investigate UFO cases, and she thinks the same is needed in the U.S.